Last week’s post (Is It Good to Eat Sugar?, Jan 25, 2012) addressed what I see as the most problematic part of the thought of the health writer Ray Peat – his support for sugar consumption. Apart from this difference, “an extreme amount of overlap is evident,” Danny Roddy notes, in our views and Peat’s. Both perspectives oppose omega-6 fats, support saturated fats, favor eating sufficient carbs to normalize metabolism, support eating nourishing foods like bone broth, and oppose eating toxic foods like wheat. Paul and Peat have similar recommendations for carbohydrate consumption. Paul’s recommendations hover around 150 grams while Peat usually recommends 180-250 grams, but he himself eats closer to ~400 grams. So I thought it might be worth looking at the issue of overall carb consumption. In Is There a Perfect Human Diet? (Jan 18, 2012) we noted that diseases can change the optimal diet. In some diseases it’s better to lower carb consumption, but in others it’s better to increase carb consumption. The example we gave is hepatitis; hepatitis B and C viruses can exploit the process of gluconeogenesis to promote their own replication, so high-carb diets which avoid gluconeogenesis tend to slow down disease progression. As someone following the PHD with a good dash of Peat, I really enjoy this post and the comments. Thank you Paul…. Paul says that “I’m not persuaded that it’s a desirable thing to keep liver glycogen filled at all times, but for some health conditions it may be good to tend that way, like hypothyroidism.” Well, according to Chris Kresser, 13 of the top 50 selling US drugs are either directly or indirectly related to hypothyroidism. If going by either the low body temperature/low pulse diagnostic, and/or some kind of pattern on the serum tests (Anti-TG, TPO, TSH, free T-3, free T4, total T3, total T4), we are talking a significant proportion of the population, especially women, being hypothyroid in some form…. Many with low T3 have a conversion problem from T4 in the liver (80% of T3 is converted from T4 in the liver and kidneys – only a small portion is coming from the thyroid gland). Is it a good idea to NOT try to fill the liver glycogen in such a pattern? For those who have lived with the consequences of low T3 (adrenaline rush, waking up in the middle of the night, fatigue, tendency to orange-yellowish color i the face etc. ), and had improvements on a more Peat like diet, I do not think so. The way to fill liver glycogen, of course, is by eating more carbs. T3, the most active thyroid hormone, has a strong effect on glucose utilization. T3 stimulates glucose transport into cells, and transport is the limiting factor in glucose utilization in many cell types. In hyperthyroidism, a condition of too much T3, there are very high levels of glucose utilization. Administration of T3 causes elevated rates of glycolysis regardless of insulin levels. The body can reduce T3 levels by converting T4 into an inactive form called reverse T3 (rT3) rather than active T3. High rT3 levels with low T3 levels lead to reduced glucose transport into cells and reduced glucose utilization throughout the body. This means that eating more carbs raises T3 levels, and eating fewer carbs lowers T3 levels. For a hypothyroid person, then, eating more carbs is an alternative tactic for increasing thyroid hormone activity. It may provide symptomatic relief similar to that achieved by supplementing thyroid hormone directly. Perhaps the two are complementary tactics that should be done together. Taking thyroid hormone pills will increase glucose utilization, creating a need to eat more carbs. A mix of the two tactics may be optimal. UPDATE: Mario points out that most cases of hypothyroidism in advanced countries are due to Hashimoto’s, an autoimmune disease probably triggered by infections or gut dysbiosis, and eating more carbs will tend to flare any gut dysbiosis and thus aggravate the thyroiditis. Meanwhile, supplemental thyroid hormone tends to reduce antibody activity. Paul, this discussion gets to the crux of what I do not understand about the Perfect Health Diet. You are speaking as if refilling liver glycogen is a good thing, and it undoubtedly is, because mood is so much better when there is sufficient liver glycogen because then the brain is confident of its power supply. Also, you acknowledge that safe starch would eventually replenish liver glycogen after muscle glycogen is topped off. So why not eat enough starch to replenish liver glycogen? It is not so difficult to figure out how much that would be. Have some sugar, feel what replenished liver glycogen is like, then titrate safe starch gradually meal-by-meal to get the same effect. When I do it, and I am not an athlete, I get 260 grams of non-fiber carb per day, which is considerably more than you usually recommend. Have you tried this experiment and found the result unsatisfactory in some way? Jim has experimented to find the amount of carbs that optimize his mood, and found it to be 260 g (1040 calories). On a 2400 calorie diet, typical for men, this would be 43% carbs. If Peat typically recommends 180 to 250 g carbs, as Danny says, then on a 2000 calorie reference diet that would be 36% to 50% carbs. Those numbers are strikingly similar to another statistic: The amount of carbs people actually eat in every country of the world. At low incomes people eat mainly carbs, because the agricultural staples like wheat, rice, corn, and sorghum provide the cheapest calories. 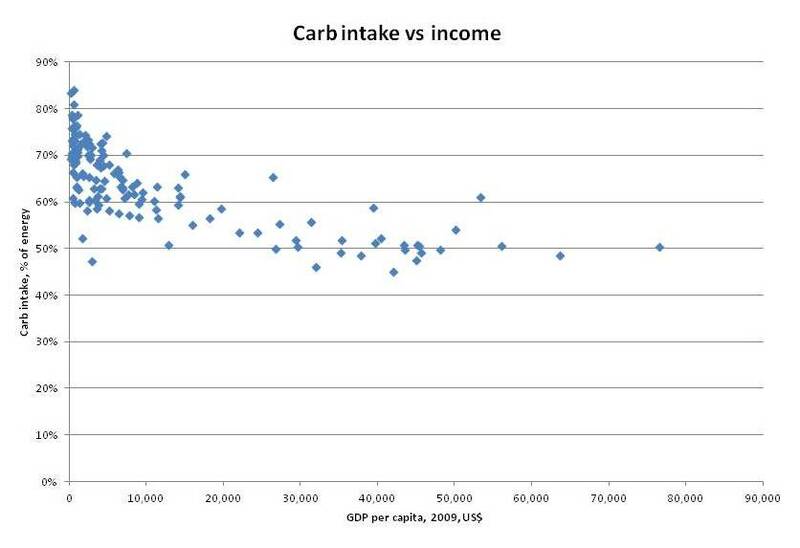 As incomes rise, carb consumption falls, but it seems to approach an asymptote slightly below 50% carbs. The lowest carb consumption was France at 45%, followed by Spain, Australia, Samoa, Switzerland, Iceland, Italy, Austria, Belgium, and Netherlands. We can guess that if money were no object, and people could eat whatever they liked, most people would select a carb intake between 40% and 50%. This is precisely the range which Jim found optimized his mood. I won’t enumerate studies here, but animal studies indicate that higher carb and protein intakes promote fertility and athleticism, while restriction of carbohydrate and protein promotes longevity. In our book, we calculate the daily glucose requirements of the human body at around 600 to 800 calories, or 30% to 40% of energy on a 2000-calorie diet. So a 30-40% carb diet is a neutral diet, which probably places minimal stress on the body. A 40-50% diet is a carb-overfed diet, which probably promotes fertility and athleticism. A 20-30% diet is a mildly carb-restricted diet, which probably promotes longevity. Do we see diminished longevity with higher carb consumption in human epidemiological data? I think so. It’s useful to compare European countries, since they are genetically and culturally similar. There is a correlation between carbohydrate intake and longevity. Here is a list of life expectancy among 46 European countries. Neglecting little countries like Monaco, San Marino, and Andorra, that are not in my carb database, the countries with the longest life expectancy are also the ones with the lowest carb consumption: Italy first, France second, Spain third, Switzerland fourth, and Iceland sixth are all countries with carb intake below 50%. Sweden, at 50.8% carbs, placed fifth in longevity. Did Evolution Hardwire a Preference for Carbs? We know that the brain has an innate food reward system which tries to get people to eat a certain diet. What carbohydrate intake is it likely to select for? The response surface for lifetime egg production peaked at a higher protein content than supported maximal lifespan (1:4 P:C, Figure 1A). This demonstrates that the flies could not maximize both lifespan and egg production rate on a single diet, and raises the interesting question of what the flies themselves prioritized – extending lifespan or maximizing lifetime egg production. Lee et al. answered this by offering one of 9 complementary food choices in the form of separate yeast and sugar solutions differing in concentration. The flies mixed a diet such that they converged upon a nutrient intake trajectory of 1:4 P:C, thereby maximizing lifetime egg production and paying the price of a diminished lifespan. This seems to be the evolutionary preference in mammals as well as flies. When unlimited food is available, animals tend to overfeed slightly on carb and protein, sacrificing lifespan for increased fertility and athleticism. Jim reported improved mood on a 43% carb diet. Is it due to the filling of liver glycogen raising metabolism? Due to a sensation of enhanced fertility, libido, and athleticism? Or simply due to greater satisfaction of the brain’s reward system? Yet another factor may also be involved. Might Stress Be Mistaken for Enhanced Energy? Peat favors sucrose as a carb source, which is why Danny Roddy recommended orange juice and Travis Culp soda. I argued in last week’s post that it would be better to eat a starchier diet so that the carb breakdown would be at least 70% glucose, less than 30% fructose and galactose. Eating a higher-carb diet fills up liver glycogen, removing the most rapid fructose disposal pathway. This makes a high-carb sucrose-based diet rather stressful for the body; it has to dispose of fructose rapidly to avoid toxicity, but has limited ability to do so. 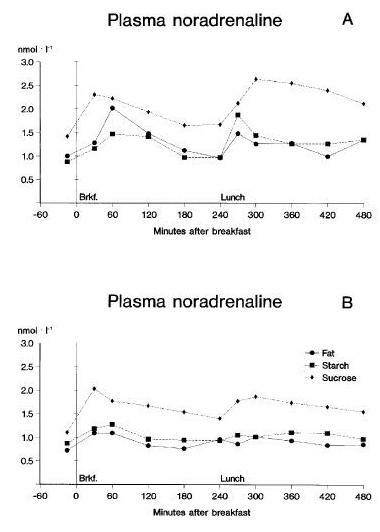 On high-fat and high-starch diets, adrenaline and noradrenaline levels are low; they are consistently elevated — almost doubled — on the high-sucrose diet. epinephrine and norepinephrine are stress hormones that underly the fight-or-flight response; they increase heart rate, trigger the release of glucose from energy stores, and increase blood flow to skeletal muscle. These hormones trigger the release of glucose from liver glycogen, thus freeing up room for fructose disposal. I consider the ability to refill glycogen (minimizing adrenaline & cortisol release) to be an important factor in health. Refilling glycogen is not the same thing as minimizing adrenaline release. The requirement to dispose of fructose may trigger adrenaline release. The reason I bring this up is not to renew the starch vs sugar discussion; but rather to ask if this “fight-or-flight” response to sugar consumption may not be partially responsible for the perceived mood and energy improvements on a Peat-style diet. Healthy and intelligent groups of people have been found to have an average resting pulse rate of 85/minute, while less healthy groups average close to 70/minute. I would have thought 60 beats per minute was normal, and when I was more athletic my pulse was typically 48 beats per minute. 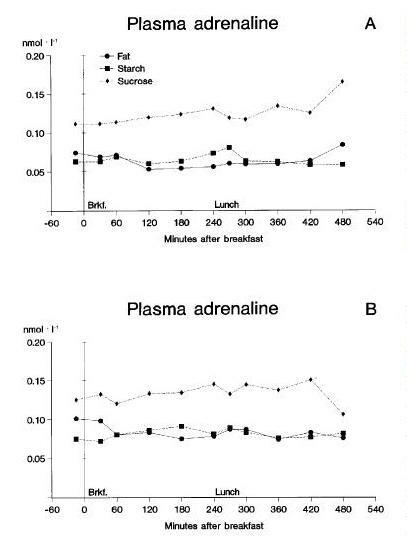 One of the effects of adrenaline and noradrenaline is to speed up the pulse rate. If Peat really does eat 400 g of carbs per day, predominantly from sucrose, then he may be achieving his high pulse rate from an “adrenaline rush” that helps dispose of an excess of fructose. If, indeed, this is a source of improved sense of well-being on Peat-style diets, it may be a double-edged sword. Chronic stimulation of the “fight-or-flight” hormones to aid in fructose disposal may have long-run negative consequences. Starch would not have had the same effect, and would surely be healthier in the long run. It is possible that higher carb intake may increase thyroid hormone levels, fertility, and athleticism, and enhance mood in some people. These gains do not come without cost. Notably, they probably involve a sacrifice of longevity. If the benefits of higher carb intake are sought, it is best to achieve them by eating starches primarily, not sugar. In our book, we recommend a slightly low-carb diet of 20-30% of calories. If we were re-writing the book now, we would probably be a bit less specific about what carb intake is best. Rather, we would say that a carb intake around 30-40% is neutral and fully meets the body’s actual glucose needs; and discuss the pros and cons of deviating from this neutral carb intake in either direction. For most people, I believe a slightly carb-restricted intake of 20-30% of calories is optimal. Most people are not currently seeking to have children or engaging in athletic competition. There is good reason to believe that mild carb restriction maximizes lifespan, and most people desire long life. As we’ve noted, supercentenarians generally eat low-carb, high-fat diets. But the spirit of our book is to educate, and let everyone design the diet that is best for them. And there is room for difference of opinion about the optimal carb intake. Raben A et al. Replacement of dietary fat by sucrose or starch: effects on 14 d ad libitum energy intake, energy expenditure and body weight in formerly obese and never-obese subjects. Int J Obes Relat Metab Disord. 1997 Oct;21(10):846-59. http://pmid.us/9347402. Full text: http://www.nature.com/ijo/journal/v21/n10/pdf/0800494a.pdf. Is It Good to Eat Sugar? A few “Peat-atarians” – followers of the iconoclastic health writer Ray Peat – have accused us of being too skeptical of fructose. They think we should promote sugar consumption. It’s true that the ability to refill glycogen is essential for health; some genetic glycogen storage disorders are fatal in early childhood. But everyone who lacks a glycogen storage disorder has the ability to refill glycogen from multiple sources. In addition to fructose, glucose sugars and starches refill glycogen, as does milk sugar (a compound of glucose and galactose). So the question is which combination of dietary sugars (a) is best at refilling glycogen and (b) makes the healthiest diet, all things considered? 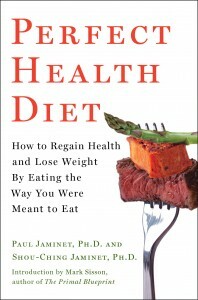 Both Danny and Travis framed their arguments as criticisms of our diet. They are really arguing that a Peat-style sugary diet is healthier than a PHD-style moderate-starch diet. So before going further, let’s look at the sugar content of the diets we’re comparing. First, note that PHD is not a zero-fructose diet. As an examination of the PHD Food Plate shows, PHD includes many fructose-containing plant foods – fruits, berries, and vegetables such as beets, onions, carrots, and squashes – plus “pleasure foods” like chocolate. Also, PHD is not a zero-dairy diet, so for many practitioners it will include some milk sugars which are half galactose and half glucose. In my diet personally, probably about 55% of carb calories come from starches, 30% from fruits, berries, and sugary vegetables, and 15% from dairy products such as yogurt. In terms of simple sugars, this translates to about 77% glucose, 15% fructose, and 8% galactose. Not every Perfect Health Dieter will have the same sugar proportions; there is no obligation to consume dairy, and the relative proportions of starchy and sugary plants will vary according to taste. But let’s take mine as characteristic PHD proportions. In a Peat-style diet, in contrast, the breakdown of sugars is near 50% glucose and 50% fructose. So we aren’t comparing fructose against glucose, but a 77% glucose 15% fructose diet against a 50% glucose 50% fructose diet. Why the Focus on Refilling Glycogen? Why do the defenders of sugar focus on its ability to refill glycogen? The reason is that fructose is treated by the body as a poison. Dietary fructose is shunted to the liver for disposal by conversion to glycogen, fat, lactate, or pyruvate. Fructose is treated like a poison because it is dangerous. High doses of fructose have observable harmful effects even in short-term studies. Fructose does no good to the liver while it’s there, in fact fructose combined with polyunsaturated fats very effectively creates liver disease. Fructose in any other organ does harm; for instance, fructose promotes cancer growth. Given fructose’s rapid disposal, any benefits from fructose have to be attributable to the glycogen or other products it is turned into. If fat, lactate, or pyruvate (a glucose product) provided benefits, dietary fats or starches would do the same, without the risk of fructose toxicity or fats getting stuck in the liver due to choline and methionine deficiency. So if fructose is to have benefits, it has to be via glycogen. That a diet with Peat-like sugar proportions – roughly 50% fructose, 50% glucose –is better than a diet with PHD-like sugar proportions – 15% fructose, 8% galactose, 77% glucose – at refilling liver glycogen. That better re-filling of liver glycogen improves the healthfulness of the diet. How Do Sugars Perform at Refilling Glycogen? Danny provides no citations for his claim that fructose “powerfully” refills glycogen. But Danny’s commenters help him out. Daz, drawing upon a New York Times report, offers two studies  . Cliff offers several more  . Let’s see what these tell us. Maltodextrin digests to glucose, so all three drinks are majority glucose. The athletes drink 275 calories of these drinks per hour for 6.5 hours after exercise. Galactose is non-toxic, but like fructose tends to be taken up by the liver. So 67% glucose / 33% galactose did the best, 67% glucose 33% fructose was close behind, and 100% glucose lagged. The second paper, “Superior endurance performance with ingestion of multiple transportable carbohydrates” , did not measure liver glycogen replenishment; instead, it gave its cyclists sugary drinks every 15 minutes throughout an intense 2-hr cycling test, and compared performance. Three different drinks were used: a 67% glucose 33% fructose drink, a 100% glucose drink, and a water-only control group. Performance was best with the 67% glucose 33% fructose drink, intermediate with the glucose drink, and worst with the water drink. The results suggest that the 67% glucose 33% fructose drink was better for liver glycogen replenishment, and that liver glycogen replenishment aided the cyclists’ performance. The third paper, “Effect of different post-exercise sugar diets on the rate of muscle glycogen synthesis” , isn’t available to me electronically, so we’ll have to work from the abstract. It looked at muscle glycogen, measured using biopsies (ouch! ), rather than liver glycogen. It first assessed the effect of different amounts of glucose. It found that 0.7 g/kg body weight of glucose given every 2 hours would maximize the rate of muscle glycogen synthesis. For an 80 kg man, that works out to 56 g or 224 calories of glucose per two-hour period, or 112 calories per hour. Above this amount, the rate of muscle glycogen synthesis is unchanged. Of course, endurance athletes know that it’s beneficial to replenish glycogen during endurance events like marathons and triathlons. Remember also that muscle glycogen is committed to be used by muscle and cannot assist in maintaining blood sugar levels. Therefore should no additional carbohydrate be ingested during prolonged exercise, the task of maintaining blood glucose levels rests firmly on the liver’s glycogen stores and gluconeogenesis (the manufacturing of glucose from plasma amino acids). Oxidation of blood glucose at 70-80% VO2 max is about 1.0 g/min or about 60 g/hour. Therefore it can be predicted that even with full glycogen stores, a less conditioned athlete’s liver will be depleted of its carbohydrate within an hour and three quarters of continuous moderate intensity exercise. (Interestingly, the daily carbohydrate requirements of the brain and nervous system alone are enough to deplete the liver glycogen stores within 24 hours.) Once liver glycogen levels begin to drop and exercise continues the body becomes increasingly hypoglycemic (low blood sugar) mainly because blood glucose is depleted faster than it is replaced by gluconeogenesis. Professor Tim Noakes considers liver glycogen depletion and subsequent hypoglycemia to be the primary factors affecting fatigue and performance during extended duration races and especially in instances where muscle glycogen levels are low as well. So marathoners and other endurance athletes will want to replenish liver glycogen as rapidly as possible during a race. What mix of sugars do they use? Carb BOOM! Energy Gels – 24-Pack consist of “a special blend of 22-25g of complex carbohydrates and just 2-4g of simple sugars to maximize energy delivery to working muscles.” The complex carbs are probably derived from starch and are 100% glucose, while the sugars probably contain some fructose. If the ratio is 2 g fructose in 25 g gel, then the composition will be 8% fructose 92% glucose. PowerBar Energy Gel, Double Caffeine, Tangerine, 1.44-Ounce Packets (Pack of 24) consists of a 2:1 glucose to fructose blend, or 67% glucose 33% fructose. Clif Bar Shot gel, razz – 1.1oz (24/box) list their primary ingredient as organic brown rice syrup, which is nearly 100% glucose. So the sugar mix ranges from 67% glucose to 100% glucose. No product uses 50% fructose. Presumably, athletes have done a great deal of personal experimentation and know that these ratios do, indeed, optimize the speed of glycogen replenishment. When athletes have no need for speed, as when they are carb loading before a marathon, then they eat starches like pasta and bread, not sugar. So to maximize total glycogen status, regardless of speed of filling, a carb mix close to 100% glucose works just fine. 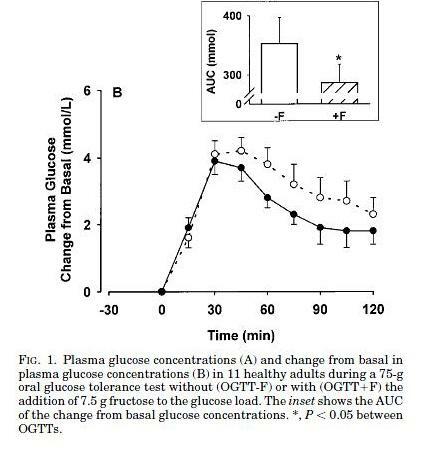 The fourth paper, “Acute fructose administration decreases the glycemic response to an oral glucose tolerance test in normal adults” , is about how a bit of fructose affects the glycemic response to an oral glucose tolerance test. In general higher insulin and lower glucose is healthier than the reverse, so this is considered an improvement. Glycogen replenishment proceeds the fastest with a mix of sugars consisting of about 70% glucose and 30% fructose or galactose. Although this wasn’t tested, we can guess that a mix of fructose and galactose would be more effective than fructose alone, since it seems that utilizing multiple carbohydrate pathways is what drives the speedier glycogen replenishment. So the fastest glycogen replenishment might occur with something like 70% glucose 15% fructose 15% galactose. Muscle glycogen replenishment is maximized with a carbohydrate intake of 100 calories per hour. Athletes agree with the research, using carb gel packs that contain typically 30-40 g carbs with a composition of 67% to 100% glucose, 0% to 33% fructose. Glycemic response to a large dose of carbohydrate may be improved by eating a 9% fructose 91% glucose mix. 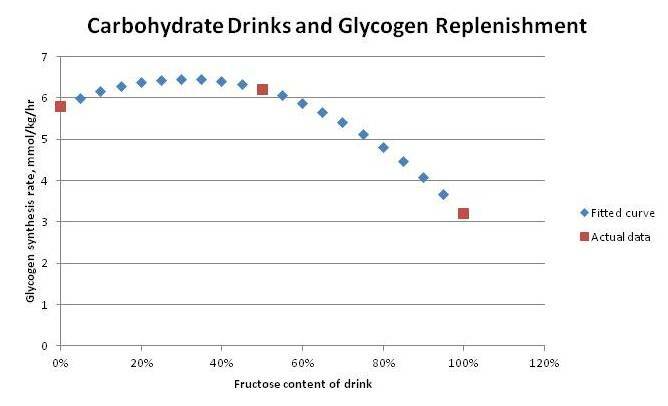 From these data, I infer that for glycogen replenishment in liver or muscle, a PHD-style carb mix of 77% glucose, 15% fructose, 8% galactose is probably equal or superior to a Peat-style carb mix of 50% glucose, 50% fructose. For athletes in the midst of a race, or in need of rapid recovery for a second race on the same day, speedy glycogen replenishment may be the endpoint to optimize. If so, they should eat a sugar drink composed of roughly 70% glucose and 30% fructose and galactose. This is closer to PHD diet ratios than to Danny Roddy’s recommendation of orange juice or Travis Culp’s recommendation of soda! But for others, speed of glycogen replenishment is hardly likely to be the parameter to optimize. There are unlikely to be significant benefits for non-athletes from replenishing glycogen 6.5% faster, as was found in the muscle glycogen study . Speedier glycogen replenishment is almost the only known benefit to fructose consumption. It’s possible that low fructose doses, about 9% of carb calories (perhaps 2-3% of total calories), may improve glycemic control. This is a lower fructose fraction than is found in PHD, and far below the fructose fraction recommended by Danny and Travis. Given the known risks of fructose consumption, especially with chronic intake at high doses or in conjunction with polyunsaturated fats, it seems prudent to err on the low side. It seems to me that the Peat-atarians have failed to provide any evidence at all in favor of a higher fructose intake than is provided by the fruits, berries, and sugary vegetables recommended by the Perfect Health Diet, save for athletes in the midst of a race or post-race recovery. Décombaz J et al. 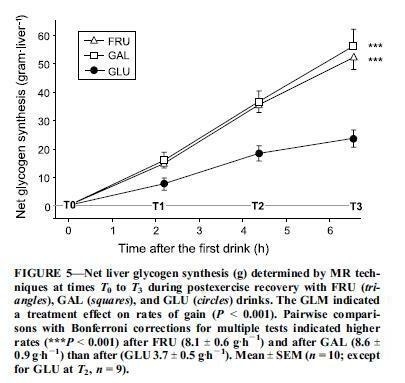 Fructose and galactose enhance postexercise human liver glycogen synthesis. Med Sci Sports Exerc. 2011 Oct;43(10):1964-71. http://pmid.us/21407126. Currell K, Jeukendrup AE. Superior endurance performance with ingestion of multiple transportable carbohydrates. Med Sci Sports Exerc. 2008 Feb;40(2):275-81. http://pmid.us/18202575. Blom PC et al. Effect of different post-exercise sugar diets on the rate of muscle glycogen synthesis. Med Sci Sports Exerc. 1987 Oct;19(5):491-6. http://pmid.us/3316904. Moore MC et al. Acute fructose administration decreases the glycemic response to an oral glucose tolerance test in normal adults. J Clin Endocrinol Metab. 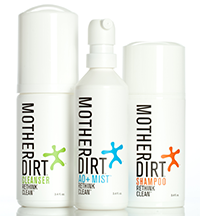 2000 Dec;85(12):4515-9. http://pmid.us/11134101.